We are getting ready to move out of state. We’re moving to Alaska to be exact! It’s a big move and we’ve decided because of the amount of money it would cost to move all of our stuff (that isn’t that valuable anyway), that we are going to sell most of it and start over in Alaska. I am looking forward to start redecorating a new house and especially a new master bedroom. I’ve rounded up some of my favorite master bedrooms from around the internet for inspiration and I hope you find something that inspires you too! 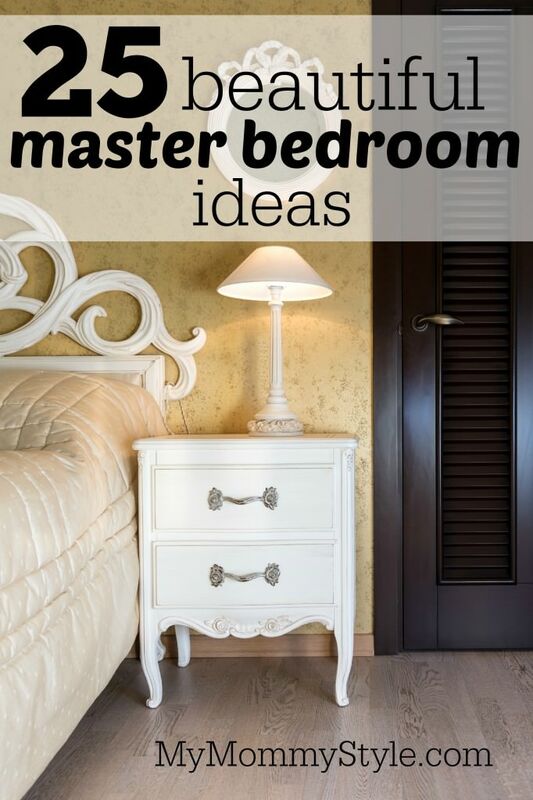 You can find even more inspiration in this roundup of guest bedroom ideas. I love this room because it is a great balance of feminine and masculine looking pieces. So the windows in this room are pretty impressive, but what about the view!? So pretty! I loved this idea of doing a gallery wall of wedding photos. All of my wedding photos are sitting in a box! I would love to pull them out and display them. How cool is this window/nook!? It looks so relaxing. I love symmetry in design. This room is oddly satisfying in its symmetry, I could stare at it all day. Oh, and that rug is pretty awesome too. That chalkboard beautifully completes this room. I would much rather have a chandelier in my room, but if I have to have a fan, this is the one that I want! Also I love the color of that accent wall. Exposed beams make my heart happy. Whitewashed exposed beams give me butterflies. So basically this room makes me swoon. Its like the perfect blend of rustic, glamor and country chic. I will admit, the blue print in the room isn’t my favorite, but replace that print with any that you like and you can personalize this space however you like. I love the built-ins above the bed! If you have never heard of Young House Love I think you should check them out. They buy old houses and then redo the whole thing. They post before and after photos that are just jaw dropping. If you own an old, out dated home, check them out because they will inspire you. Behind the drapes next to the bed are shelves to better utilize the space in this small master bedroom. They added extra storage space and made it look beautiful. I love gallery walls, but never thought about putting one above my bed. I love the idea just as much as I love that gorgeous paint color. How cool is this plank wall from The Potters-Place!? She gives a great tutorial on how to make your own. 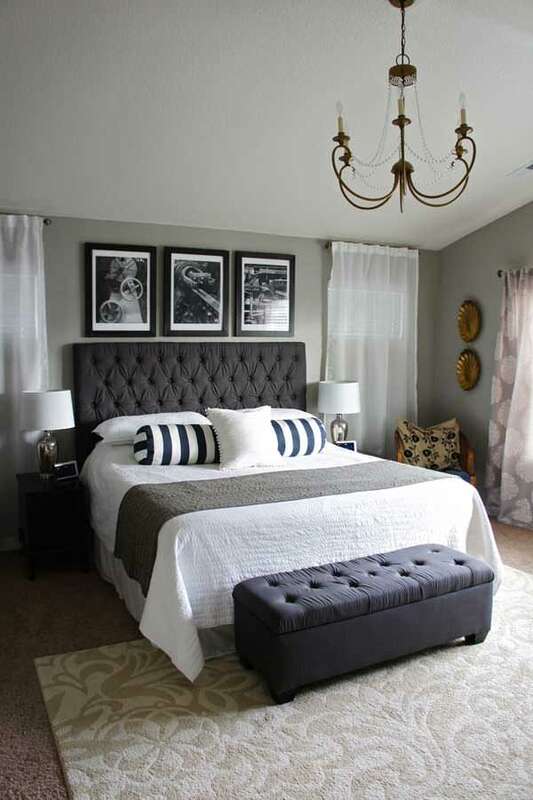 Transform you bedroom by adding some texture and clean lines. This room makeover from Sweet Charli shows what some texture and cute accessories can do for your bedroom! Gorgeous! I share my bed with my husband and I have never thought of having a picture of us above our bed, but it makes sense! I like how big Our Thrifty Ideas made the frame and photo and making it black and white helps the other colors in theroom pop. The colors, textures, decor, and styling of this room are spot on. Love it. This looks like a calm, peaceful place to sleep. I would love this room. This headboard is made out of a 90 year old door. I love that it looks cool and has a cool story. The colors in this room are perfection. I especially love that it looks like a bright and colorful room without looking busy. And the exposed beams! I think I already expressed my love for exposed beams. This room is calming and beautiful and I love that ceiling! This room has color, texture and personality. I love that light fixture and beautiful print. I would have never thought of doing this for a headboard, but it is so cool. The lamps and artwork really help to frame it. I would love the Serena comforter set!